Hardcourt bike polo is a quickly growing coed sport that is played throughout the world, with clubs popping up in nearly every country on the map. The sport originated around the turn of the 21st century in North America and vigorously spread to cities in South America, Europe, and Asia. Hardcourt bike polo’s roots are in the original form of bicycle polo, which is played on a grassy field with wooden mallets and originated in County Wicklow, Ireland around the turn of the 20th century. The women and men who play bike polo, both competitively and for pleasure, are dedicated to the advancement of the sport, maintaining the integrity and competitiveness of a serious game while supporting a cohesive community that is shared around the globe, making hardcourt bike polo an increasingly important part of the cycling world. 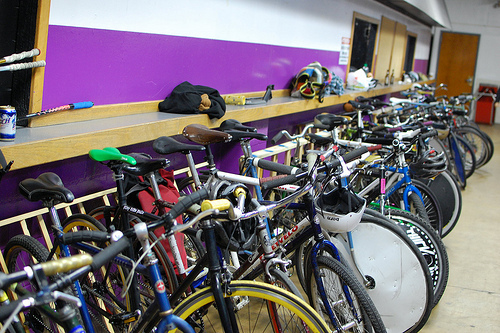 Players of all ages and backgrounds share the courts for weekly pickup games, tournaments, and other fun polo-oriented events such as 24-hour Polo Lock-ins, Polo Camp, and regional tournaments that often integrate alleycats or other bike-specific activities. 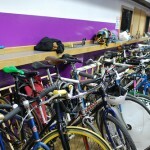 A point of pride among bike polo players everywhere is the welcoming attitude and fun environment the polo community offers to anyone interested in playing the game. Hardcourt bike polo is played on a flat, hard surface such as a tennis court, roller hockey rink, or even a parking lot, which is then customized using wooden boards or fencing to prevent the ball from exiting the court perimeter. The size of the court ranges from city to city, but must be large enough to accommodate for six players to move freely around the court. 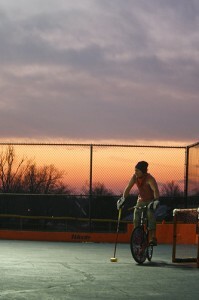 Hardcourt bike polo is played with two teams of three players. Each team claims one side of the court with a goal. At the start of a game, the ball is placed in the center of the court and players wait behind their respective goal for the “joust.” At the call, “3-2-1 Polo,” players charge the center of the court to gain ownership of the ball. Once possession is gained, the ball is in play and shots can be taken. The ball can be handled by any part of the mallet; however, goals can only be scored using the end of the mallet. If the side of the mallet is used to push the ball into the goal, a “shuffle” is declared and play continues with no goal scored. A player may assume the position of goalkeeper, but positions typically rotate among teammates depending on the location of the ball and the players’ level of skills. If a player touches the ground with any body part (commonly referred to as a “foot down”), the player must “tap out,” which involves touching the mallet to one of two central spots on the court sidelines. 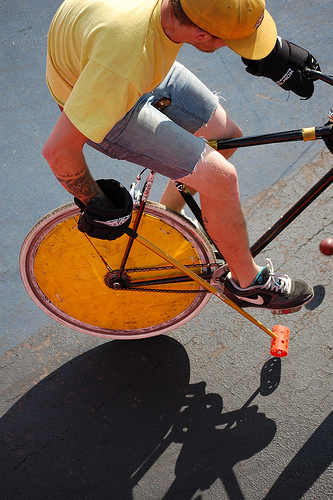 Physical contact is acceptable in bike polo, but is typically restricted to mallet-to-mallet or body-to-body. If a player’s conduct is considered excessive, he or she can be expelled from a game or must endure a time penalty. Games typically last to either three or five goals; however, depending on the format of the game or tournament, time limits are sometimes used to restrict game time. Adhering to a DIY attitude, most players create their own unique mallets, wheel covers, and other accessories using various materials and techniques. A few companies, however, have started to sell ready-made polo mallets and wheel covers. Polo mallets. A typical bike polo mallet consists of a ski pole as the shaft with the end connected to a piece of ABS pipe or high density gas pipe (typically 4-6” in length) with a wood screw. Modifications to this basic design are numerous and different players prefer different diameters, lengths, weights, etc. Wheel covers. Wheel covers are usually made from corrugated plastic that is cut in the shape of the bike’s wheels. The covers help to protect wheel spokes and aid in preventing the ball from entering the goal when the player is tending goal. Polo balls. 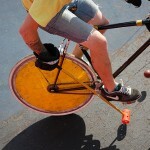 Hardcourt bike polo is played with a plastic street hockey ball. Street hockey balls are available in several densities to compensate for varying temperatures, allowing bike polo to be played during any season. Polo bikes. Many polo bikes are customized to players’ specific needs and playing styles. Most bikes used to play bike polo are geared lower since quick acceleration and control is important to winning the ball in such a tight space. Polo bikes are typically single speed with a single brake lever located on the player’s free hand side. Short handlebars are preferable to provide maximum swinging range for the mallet. Wheel size, frame type, braking system, and pedals are all determined by the player’s preference. Polo goals. The goals can range from parking cones to goals similar to those used in street hockey. Protection. Injuries can happen when playing an intense game of bike polo, so many players choose to wear padding and helmets. 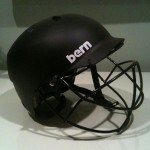 Hockey gloves, modified helmets, and knee pads are commonly worn during games, and helmets are often a requirement when competing in a tournament. For the official hardcourt bike polo ruleset (North America only) or to find out about tournaments or clubs near you, visit the North American Hardcourt website or www.leagueofbikepolo.com.